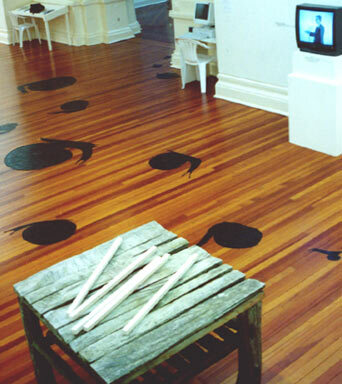 Dans le jardin des beaux arts (the snail forms), Stars for feet, (transparency of child's foot) Video compilation, Grains of Salt, Virtue of the Rose (small objects on the back wall), A Tangled Tale (on right wall), Certain Measures (sticks on the table), detail of a work on the right by Sarah Buist. New Zealand / Aotearoa, 2000. 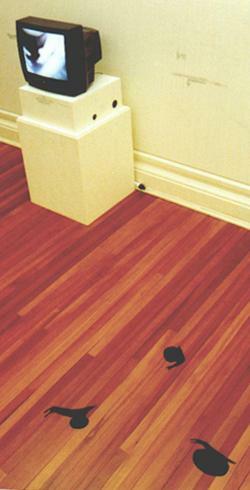 I was unsure of the facilities in the gallery half-way across the globe. And then in consultation with Jacqueline and Sen, we decided that it would be an interesting challenge to bring art which was intended to work as part of a process with the public. Art that seemed to lie around waiting to be brought to life. At the same time we wanted the work to be fun or easy for a general public to relate to and so we chose the 'common snail' as our mascot. The flat snail silhouttes could be seen to symbols the snail self or the shadow (simula) of snails in all forms and sizes. 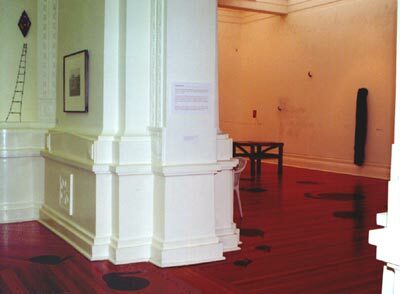 Above: On the Left are two works from the adjacent exhibition: "Who Am I? 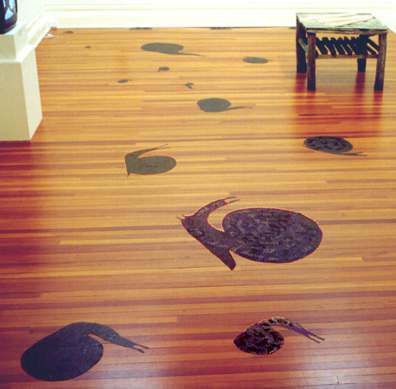 - Art and Belief" and you can see that a few snails have escaped from the wing of our exhibition: "Korero, korero". The spiralling texts on the black surfaces were also important. 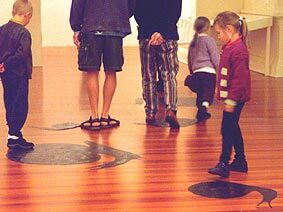 Not just to help the audience to engage with the forms but to create a feeling of the poetic, metaphorical or just plain fun. On each snail form a text spirals inwards. 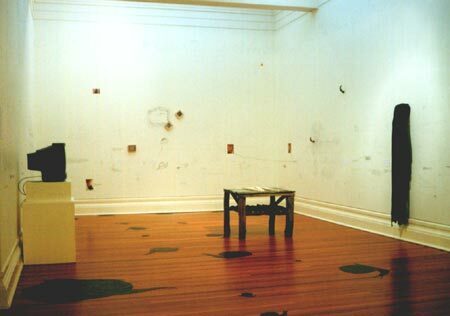 So the walls were intentionally left fairly empty with just a few postcards or small objects hanging here and there. 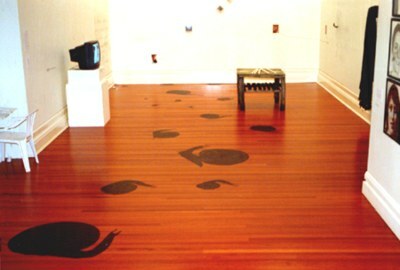 During the two month exhibition, members of the public drew images or added words as a result of workshops done with Sonja around the snails. Still from the video, Crossing. About the interactive element of this project: Interactive adventures incorporating art by some of the artists in the Leiden show as well as video clips from the installations and performances in various locations.